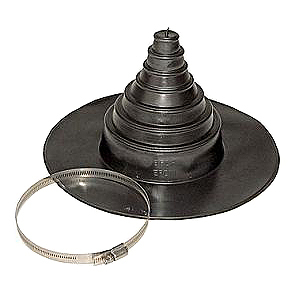 Pre-molded EPDM pipe flashings are 7-3/8 high with a 13" wide base. Peel/Stick adhesive is pre-applied all around the base, and includes a siliconized peel away cover. Includes stainless steel pipe clamp for pipe seals. All types of EPDM & TPO Roofing. INSTALLATION: All surfaces require mandatory cleaning and a butyl tape primer. TPO requires TPO primer. See data on related primers for installation instructions. Pipes of all types from 1" to 6" diameter.